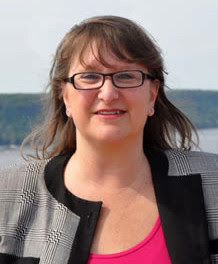 Elizabeth Lorris Ritter is a community dynamo and tireless advocate for the Washington Heights-Inwood community. Whether delivering effective government service in Senator Adriano Espaillat's office, serving admirably for twenty-five years as founding president of the Hudson Heights Owners Coalition, or being one of the most important leaders on Community Board 12 for over two decades, Liz's strong support and love for the arts has enhanced countless uptown groups. She is a bridge-builder in a time of wall-builders. Her unmatchable level of civic engagement is all about bringing people together—looping in one person to the next to ensure that great things happen for our beloved Upper Manhattan. She is a friend to friends and the most loyal and keen of counselors. Liz is tireless, fearless, bold and loud—just what we need in a time in which the amplified voices of "nasty women" will win us the day. The totality of her remarkable achievements make Liz a most deserving recipient of the UPstanding Person of the Year award.